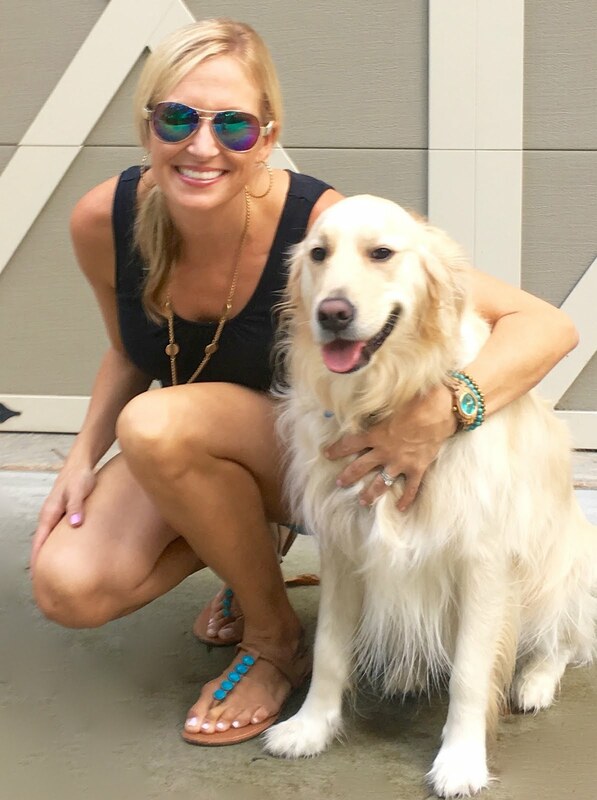 Happy Tuesday, friends! Look at us with two Fashion Fix posts back-to-back. I hope everyone took advantage of the Lilly Sale yesterday and if not there is still time! Jen and I had fun doing a little sale shopping and can't wait to share our goodies! Today though I'm so excited to share my new watch with y'all. 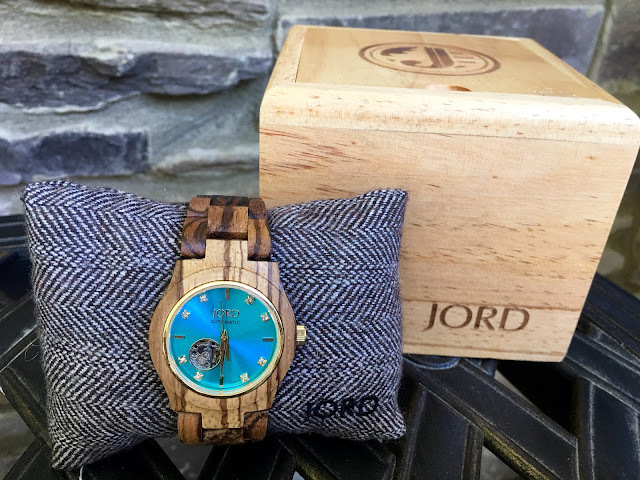 A few weeks ago the awesome people at JORD wood watches asked if we would be interested in checking out there unique watches. 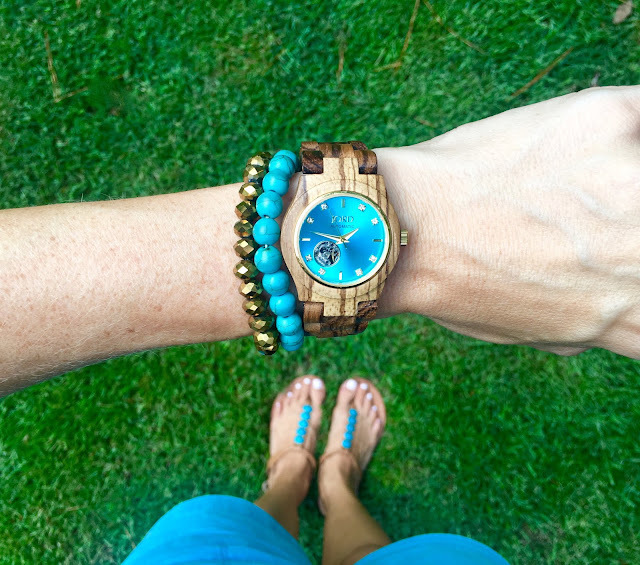 I jumped at the chance because I have a friend that has a wood watch and I always notice it when she has it on. There is something so unique about it that just stands out and is really different in a really good way. After checking out their website I saw so many different styles that I really liked, but ultimately decided on the zebrawood and turquoise style from the Cora series. 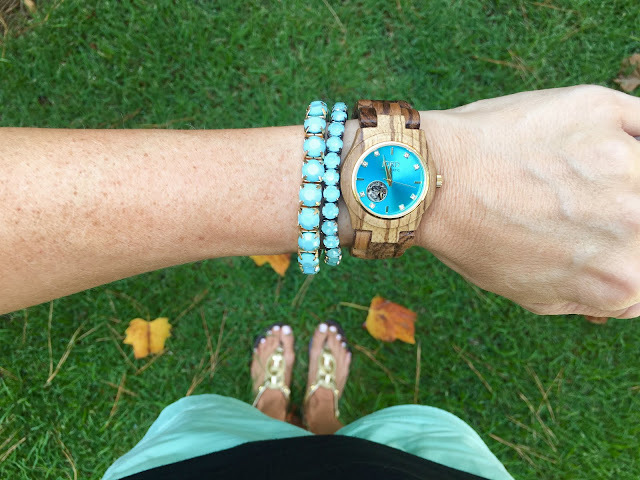 Turquoise is one of my favorite colors and I wear a lot of it so I knew this watch would match so much of my wardrobe. Also, the zebrawood had such a unique look to the wood with the contrasting colors of the grain. I couldn't wait for my new watch to arrive and I was immediately impressed. It arrived in a wooden box and when I opened it and saw the gorgeous zebrawood and cool turquoise I was in love! After looking at it close up I thought it was so neat to be able to see the moving parts of the watch through the little peep hole on the face and on the back of the watch there is a glass window where you can see the mechanisms and the rocking pendulum that keeps the watch going. That's right...there is no battery and it simply stays wound with the natural movement of your body. While the movements and the mechanism are pretty impressive, what I'm most impressed with is the look and feel of this watch. It goes great with pretty much all of my summer clothes and I know it will transition well into fall, too. As soon as it cools off I picture wearing it with jeans, booties, cute tops, and turquoise accessories. For now though the heat is still here in the south and shorts and tank tops are in order. 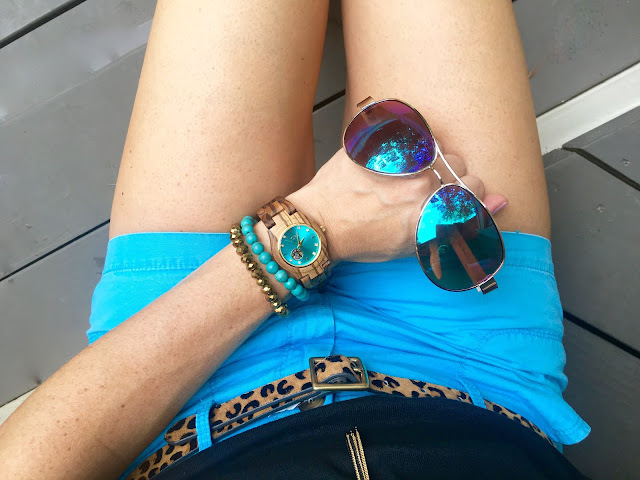 It's no secret that Jen and I love leopard print and I love how the colors of the zebrawood on my watch compliment my leopard belt so well. I wear this belt ALL of the time, no matter what the season, so I know my new watch will be worn just as much! The other really surprising thing I found about my watch was how lightweight it is. I guess I just figured that because it was made of wood that it would feel heavy, but instead it feels much lighter than my gold and silver watches. It's also a really fun addition to my little arm party. 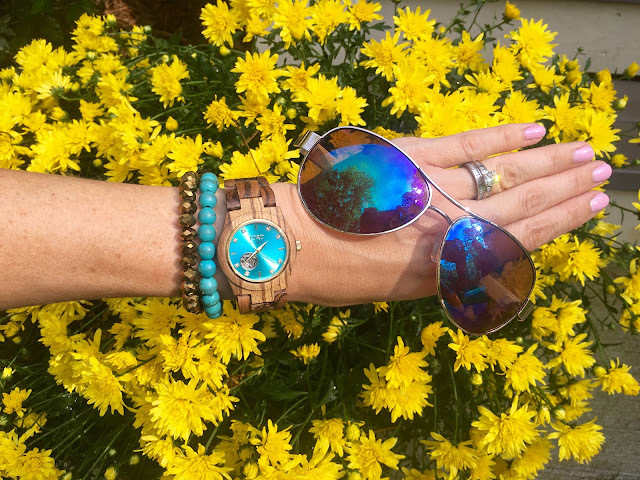 I always wear a few bracelets stacked with a my watches and I love how my turquoise and gold bracelets really bring out the colors of this watch. Have you browsed JORD's site yet? Fallen in love with a cool watch for yourself or are you thinking about someone that might love a unique watch as a gift? You know it is never too early to start Christmas shopping!!! If so, y'all are in luck because we've partnered with JORD for a giveaway! All you have to do is click HERE to sign up for a chance to win. The winner will receive a $75 coupon code to be put towards a watch of their choice. And if you don't win, you will still receive a $20 coupon code just for entering! The contest ends August 31st so be sure to click and sign up today for your chance to win! To learn more, you can check out JORD on Instagram, Facebook, Twitter, or Pinterest. This post was sponsored by JORD wood watches. All thoughts and opinions are my own. I really do LOVE this watch!